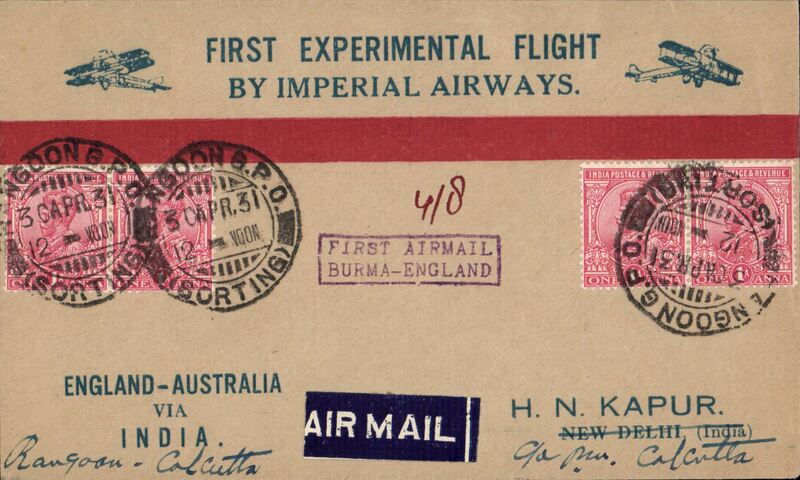 Rangoon to London, bs 15/5 and IAW clock receiver, carried on the Return of 1st Experimental Flight to Australia, Imperial Airways official long cover, franked 15annas, nice strike violet boxed "First Airmail Burma-England" cachet, typed 'Per Airoplane/Southern Cross'. Image. Scarce Rangoon to Athens, 10/5 arrival ds's front and verso, London, bs 15/5 and IAW clock receiver, carried on the Return of 1st Experimental Flight to Australia, Imperial Airways official long cover, franked 15annas, good strike violet boxed "First Airmail Burma-England" cachet, red 'biplane' arrival cachet, typed 'Per Airoplane/Southern Cross'. Image. Only 20 flown. Return First Experimental England-Australia flight, Rangoon to London, bs 14/5, plain cover, franked 15a, violet boxed "First Airmail/Burma-England" cachet, ms "Per Airoplane/Southern Cross", A scarce item, according to Stephen Smith only 38 covers carried to countries beyond Karachi, ref article detailing dispatches from India on the 1st and 2nd England-Australia flights and published in the Monthly Bulletin of the Indian Airmail Society. 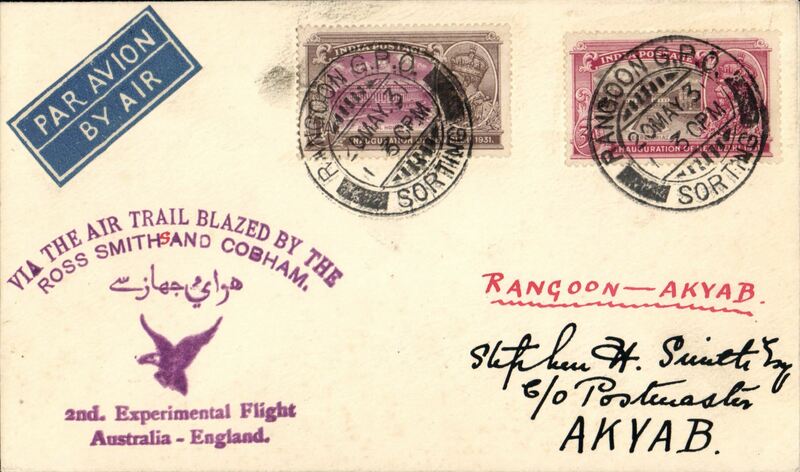 Return First Experimental England-Australia flight, Rangoon to Calcutta, bs 4/5, attractive souvenir cover franked 4a, fine strike violet boxed "First Airmail/Burma-England" cachet. "Exceedingly scarce", ref Calcutta Philatelist, Dec 1933, p255. 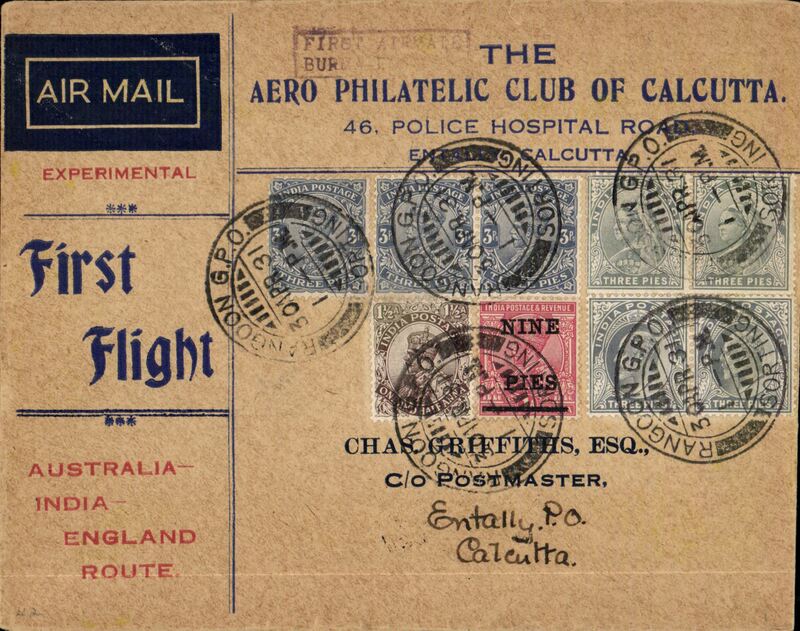 Return First Experimental England-Australia flight, Rangoon to Calcutta, bs 4/5, attractive Aerophilatelic Club of Calcutta souvenir cover, violet boxed "First Airmail/Burma-England" cachet, "Exceedingly scarce", ref Calcutta Philatelist, Dec 1933, p255. Nice item. 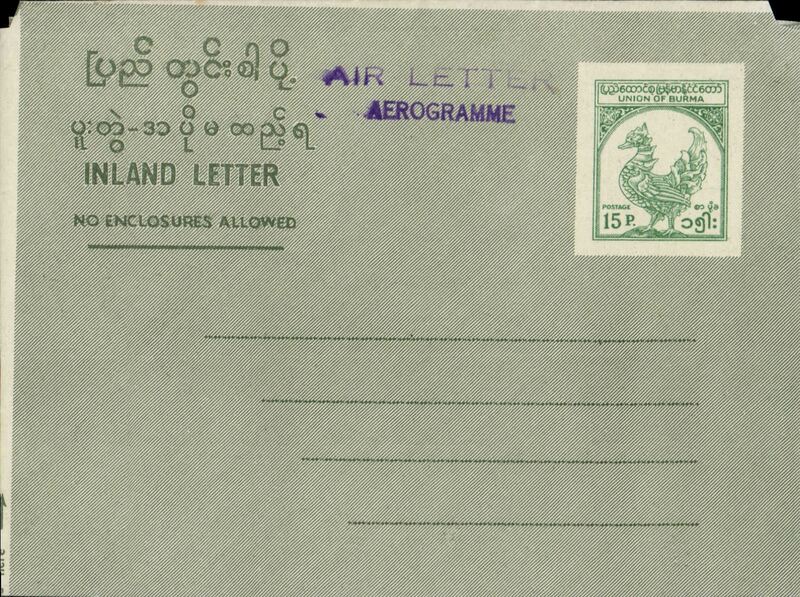 Return 2nd Experimental England-Australia flight, Rangoon to Akyab , bs 25/5, franked 4a, very fine strike arced violet "Via The Air Trail Blazed By The/Ross Smith and Cogham" cachet (see Brown J, p42), airmail etiquette cover addressed to Stephen Smith, ms "Akyab - Calcutta", Imperial Airways. Signed facsimile Stephen Smith, only few pieces flown, see Davis "Monthly Air Mail", Jun 1931, pp1-3. Very fine, see image. 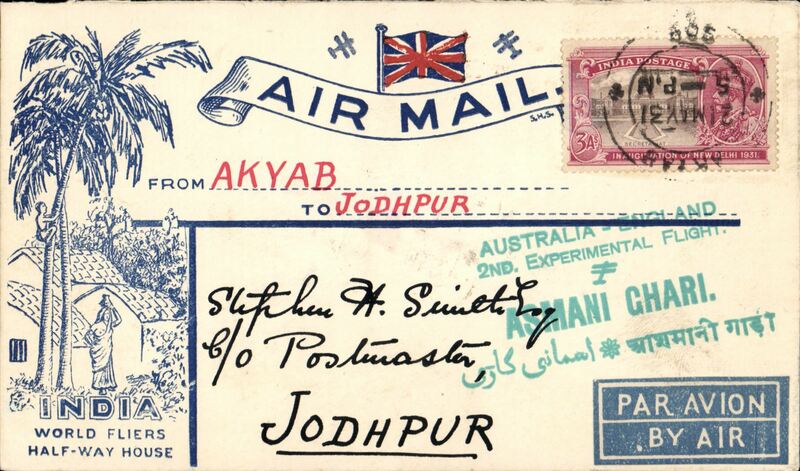 Return 2nd Experimental England-Australia flight, Akyab to Johdpur, bs 27/5, franked 8a, very fine strike green "Australia-England/ 2nd Experimental Flight/Asmani Chari" cachet (see Brown J, p42), airmail etiquette cover addressed to Stephen Smith, ms "Akyab to Johdpur", Imperial Airways. Signed facsimile Stephen Smith, only few pieces flown, see Davis "Monthly Air Mail", Jun 1931, pp1-3. Very fine, see image. 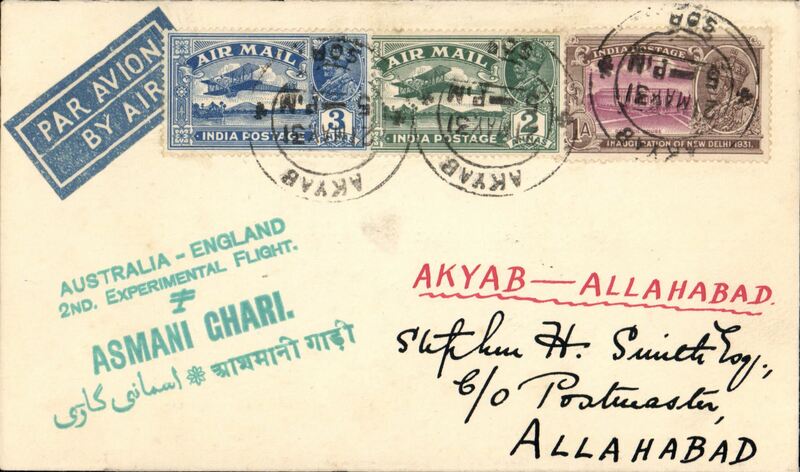 Return 2nd Experimental England-Australia flight, Akyab to Allahabad, bs 26/5, franked 6a, very fine strike green "Australia-England/ 2nd Experimental Flight/Asmani Chari" cachet (see Brown J, p42), airmail etiquette cover addressed to Stephen Smith, ms "Akyab to Alahabad", Imperial Airways. Signed facsimile Stephen Smith, only few pieces flown, see Davis "Monthly Air Mail", Jun 1931, pp1-3. Very fine, see image. 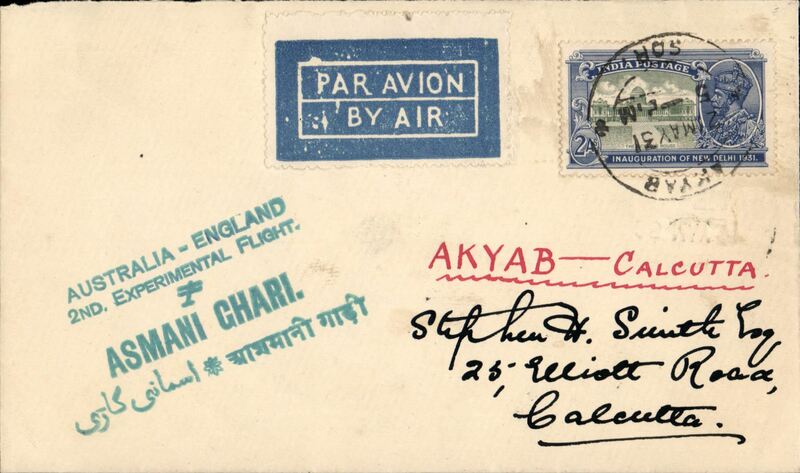 Return 2nd Experimental England-Australia flight, Akyab to Calcutta, bs 27/5, franked 4a, very fine strike green "Australia-England/ 2nd Experimental Flight/Asmani Chari" cachet (see Brown J, p42), airmail etiquette cover addressed to Stephen Smith, ms "Akyab - Calcutta", Imperial Airways. Signed facsimile Stephen Smith, only 17 pieces, see Davis "Monthly Air Mail", Jun 1931, pp1-3. Very fine, see image. 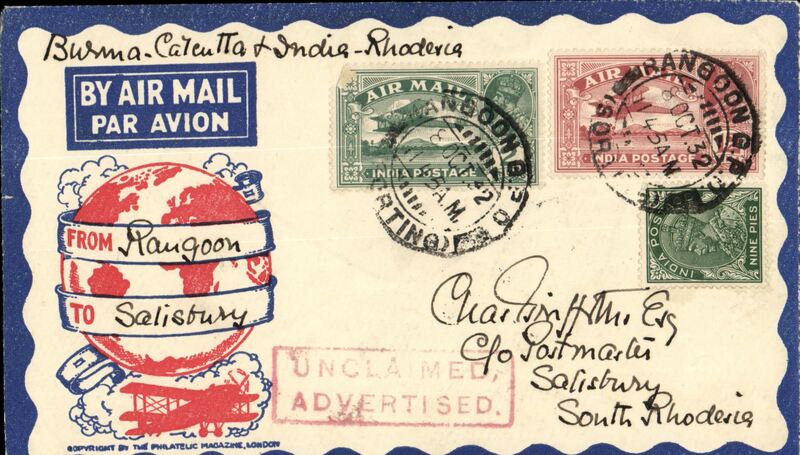 First acceptance of S. Rhodesia mail from Burma, Rangoon to Salisbury, bs 10/11, carried on Air Orient or KLM F/F from Rangoon (see Brown, Indian Air Mails), then Imperial Airways Eastern and African services to Salisbury, ms "Burma-Calcutta-India-Rhodesia", attractive Philatelic Magazine cover, Air Orient/Imperial Airways. Imperial Airways/ITCA, Rangoon to Cairo, carried on first return of extension of India service to Rangoon, bs 61/0 and on to Heliopolis 7/10, violet "dumbbell" flight cachet verso, yellow/blue official cover, Imperial Airways. F/F Rangoon to London, b/s Oxford 10/10, carried on first return of extension of India service to Rangoon, violet "dumbbell" flight cachet verso, yellow/blue official cover, Imperial Airways. 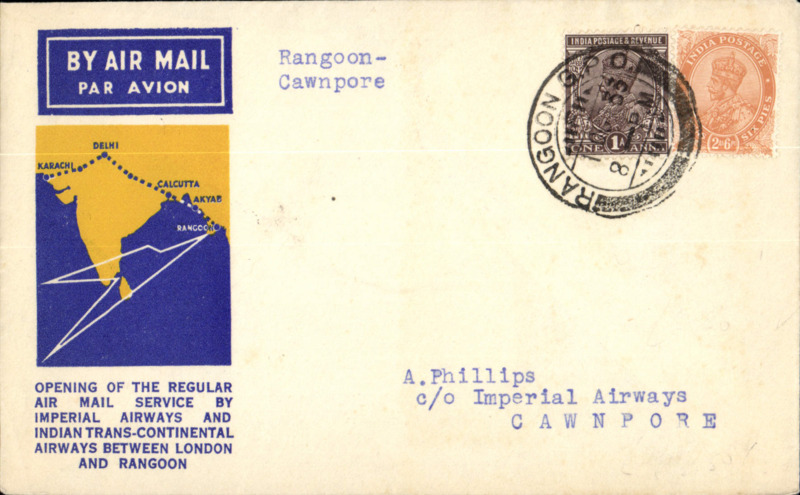 Imperial Airways, Rangoon to Cawnpore, bs 3/10, official yellow/blue/cream souvenir 'map' cover, franked 3a 6p, violet binocular shaped cachet verso. The first mails from England to Burma left Croydon on 23 September 1933. At Cairo they were transferred to an Imperial Airways Hannibal class airliner for the flight to Karachi via the Arabian halts. From there they were carried by Indian Trans-Continental Airways’ Arethusa G-ABPI to Rangoon via Akyab. The flight added 700 miles to the England-Australia chain. The return flight, by the airliner Athena G-ABTK left Rangoon at 7am on 2 October 1933, connecting with Imperial Airways at Karachi on 4 October (ref Brown J, Indian Air Mails, 1995, and Wingent P, 1999). Very small mail. Rangoon to London, no arrival ds, carried on first return of extension of India service to Rangoon, violet "dumbbell" Rangoon-Karachi-London flight cachet front and verso, plain cover, Imperial Airways. F/F Akyab to London, Leigh on Sea 11/10 arrival ds on front, carried on first return of extension of India service to Rangoon, plain Capt. 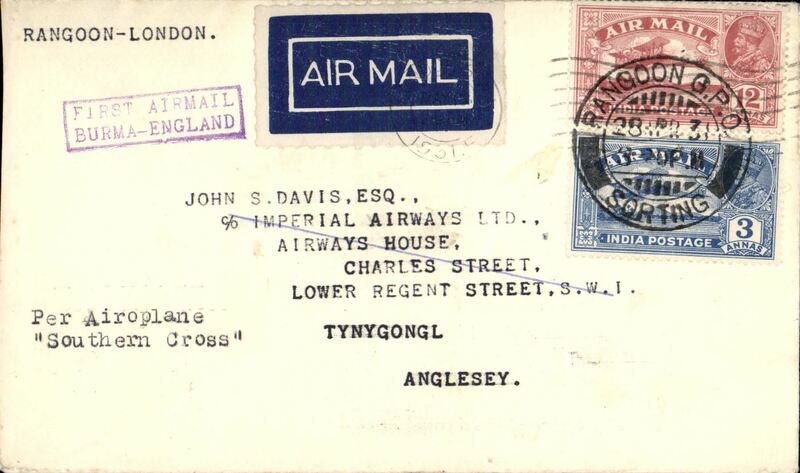 Smye cover franked 8 1/2 annas, Imperial Airways. IA/ITCA extension of Indian route to Rangoon, Rangoon to Calcutta, no arrival ds, airmail etiquette cover franked 3 annas 3p, canc official purple 'dumbbell' Rangoon/2 Oct 33 flight cachet. Small mail, Newall 33.18c3, 70u. Imperial Airways, Akyab to London, Imperial AW/Airway Terminal arrival hs verso, official yellow/blue/cream souvenir 'map' cover, franked 8 1/2 annas. 'Akyab-Londn hs. Imperial Airways, Rangoon to London, no arrival ds, official yellow/blue/cream souvenir 'map' cover, franked 8a 6p, violet binocular shaped cachet verso. The first mails from England to Burma left Croydon on 23 September 1933. At Cairo they were transferred to an Imperial Airways Hannibal class airliner for the flight to Karachi via the Arabian halts. From there they were carried by Indian Trans-Continental Airways’ Arethusa G-ABPI to Rangoon via Akyab. The flight added 700 miles to the England-Australia chain. The return flight, by the airliner Athena G-ABTK left Rangoon at 7am on 2 October 1933, connecting with Imperial Airways at Karachi on 4 October (ref Brown J, Indian Air Mails, 1995, and Wingent P, 1999). 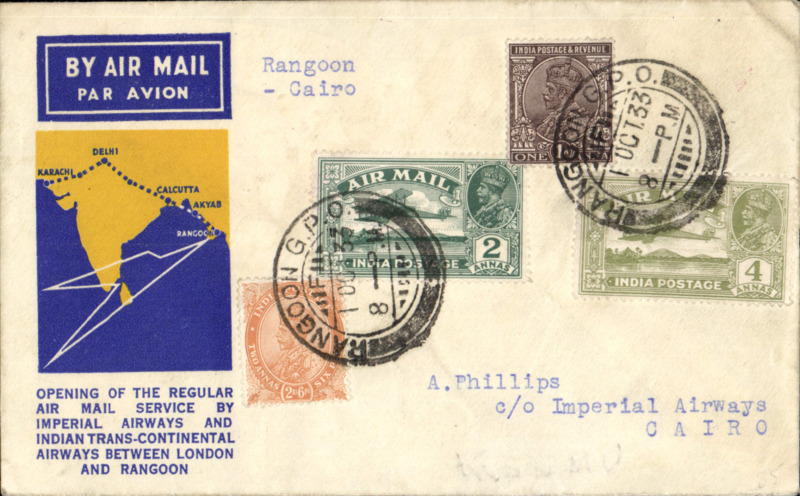 Imperial Airways, Rangoon to Cawnpore, plain cover, franked 3a 6p, violet binocular shaped cachet verso. 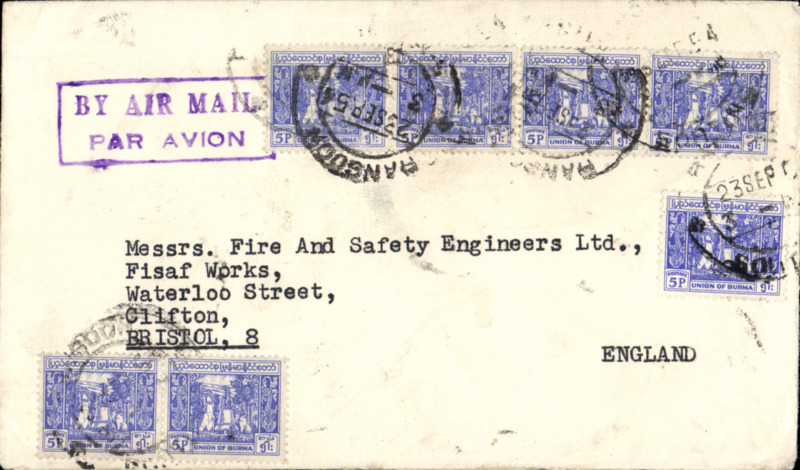 The first mails from England to Burma left Croydon on 23 September 1933. At Cairo they were transferred to an Imperial Airways Hannibal class airliner for the flight to Karachi via the Arabian halts. From there they were carried by Indian Trans-Continental Airways’ Arethusa G-ABPI to Rangoon via Akyab. The flight added 700 miles to the England-Australia chain. The return flight, by the airliner Athena G-ABTK left Rangoon at 7am on 2 October 1933, connecting with Imperial Airways at Karachi on 4 October (ref Brown J, Indian Air Mails, 1995, and Wingent P, 1999). Very small mail. 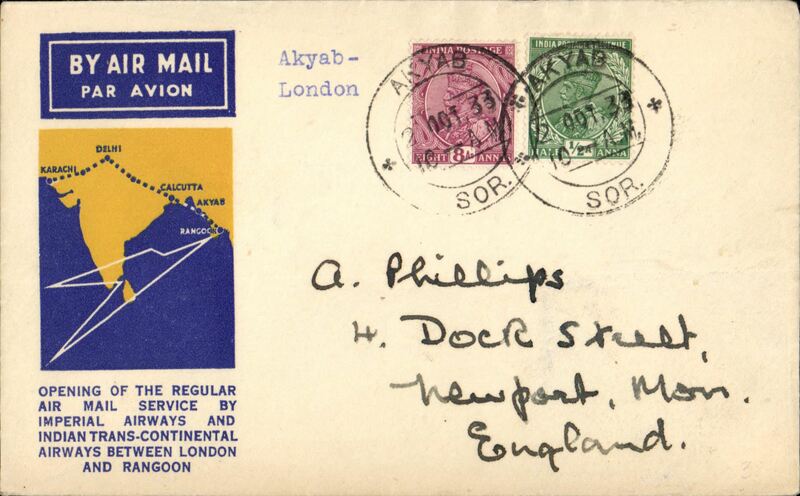 Imperial Airways, Akyab to London, no arrival ds, official yellow/blue/cream souvenir 'map' cover, franked 8a 6p. The first mails from England to Burma left Croydon on 23 September 1933. At Cairo they were transferred to an Imperial Airways Hannibal class airliner for the flight to Karachi via the Arabian halts. From there they were carried by Indian Trans-Continental Airways’ Arethusa G-ABPI to Rangoon via Akyab. The flight added 700 miles to the England-Australia chain. The return flight, by the airliner Athena G-ABTK left Rangoon at 7am on 2 October 1933, connecting with Imperial Airways at Karachi on 4 October (ref Brown J, Indian Air Mails, 1995, and Wingent P, 1999). 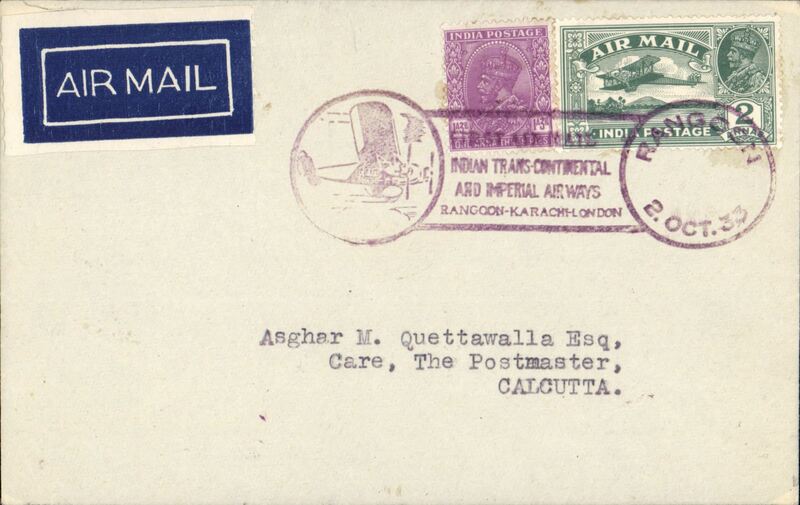 Imperial Airways, Rangoon to Karachi, bs 4/10 and 4/10 arrival ds on front, plain cover, franked 3 1/4a, violet binocular shaped cachet verso. 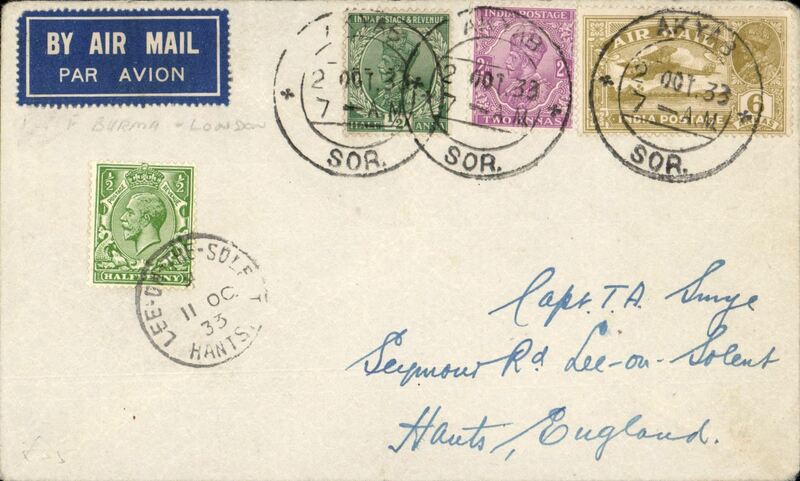 The first mails from England to Burma left Croydon on 23 September 1933. At Cairo they were transferred to an Imperial Airways Hannibal class airliner for the flight to Karachi via the Arabian halts. From there they were carried by Indian Trans-Continental Airways’ Arethusa G-ABPI to Rangoon via Akyab. The flight added 700 miles to the England-Australia chain. The return flight, by the airliner Athena G-ABTK left Rangoon at 7am on 2 October 1933, connecting with Imperial Airways at Karachi on 4 October (ref Brown J, Indian Air Mails, 1995, and Wingent P, 1999). Small mail. Typed up on album page with map of route. Imperial Airways, Rangoon to Basra, bs 5/10, official yellow/blue/cream souvenir 'map' cover, franked 6a, violet binocular shaped cachet verso. 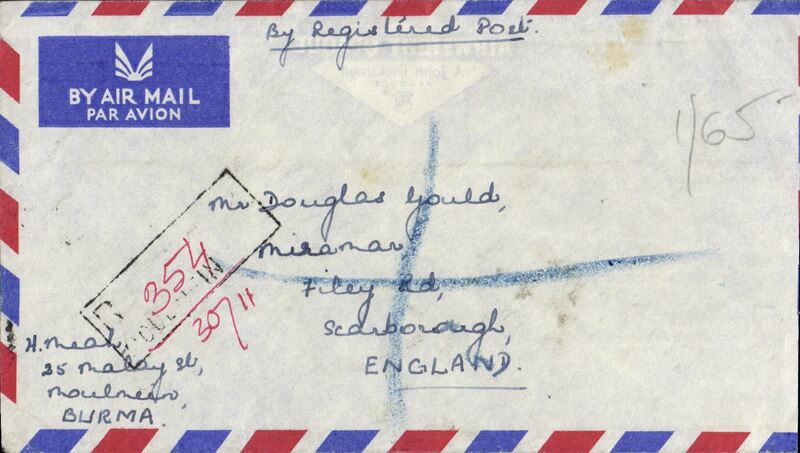 The first mails from England to Burma left Croydon on 23 September 1933. At Cairo they were transferred to an Imperial Airways Hannibal class airliner for the flight to Karachi via the Arabian halts. From there they were carried by Indian Trans-Continental Airways’ Arethusa G-ABPI to Rangoon via Akyab. The flight added 700 miles to the England-Australia chain. The return flight, by the airliner Athena G-ABTK left Rangoon at 7am on 2 October 1933, connecting with Imperial Airways at Karachi on 4 October (ref Brown J, Indian Air Mails, 1995, and Wingent P, 1999). Small mail. Imperial Airways, Rangoon to Gaza, bs 6/10, official yellow/blue/cream souvenir 'map' cover, franked 9a 6p, violet binocular shaped cachet verso. The first mails from England to Burma left Croydon on 23 September 1933. At Cairo they were transferred to an Imperial Airways Hannibal class airliner for the flight to Karachi via the Arabian halts. From there they were carried by Indian Trans-Continental Airways’ Arethusa G-ABPI to Rangoon via Akyab. The flight added 700 miles to the England-Australia chain. The return flight, by the airliner Athena G-ABTK left Rangoon at 7am on 2 October 1933, connecting with Imperial Airways at Karachi on 4 October (ref Brown J, Indian Air Mails, 1995, and Wingent P, 1999). Very small mail. Imperial Airways, Rangoon to Gwadar, bs 4/10, official yellow/blue/cream souvenir 'map' cover, franked 6 1/2a, violet binocular shaped cachet verso. 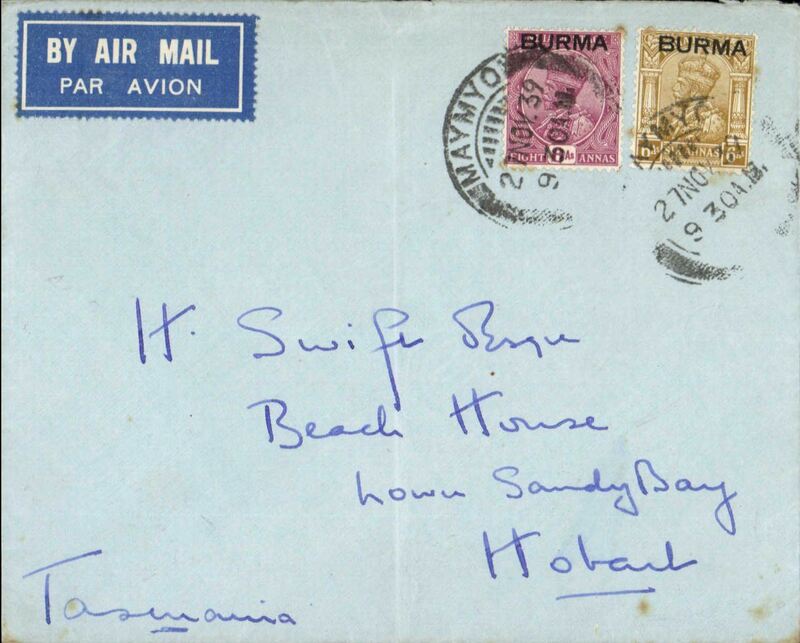 The first mails from England to Burma left Croydon on 23 September 1933. At Cairo they were transferred to an Imperial Airways Hannibal class airliner for the flight to Karachi via the Arabian halts. From there they were carried by Indian Trans-Continental Airways’ Arethusa G-ABPI to Rangoon via Akyab. The flight added 700 miles to the England-Australia chain. The return flight, by the airliner Athena G-ABTK left Rangoon at 7am on 2 October 1933, connecting with Imperial Airways at Karachi on 4 October (ref Brown J, Indian Air Mails, 1995). Mail to Gwadar is scarce. 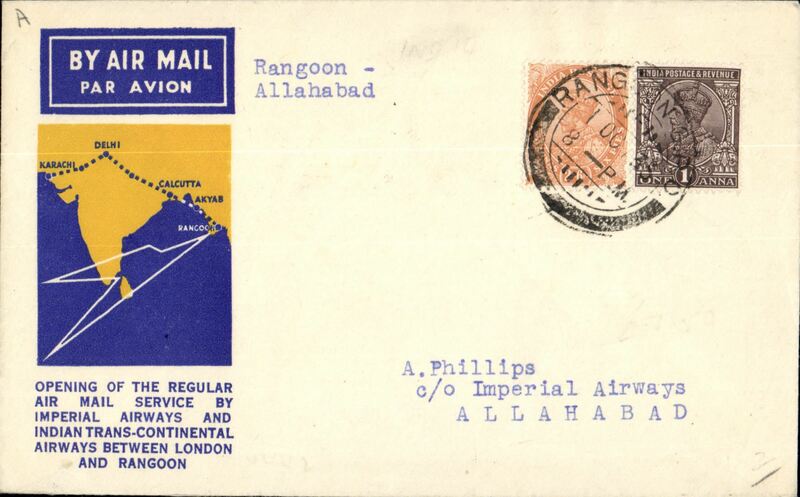 Imperial Airways, Rangoon to Allahabad, bs 3/10, official yellow/blue/cream souvenir 'map' cover, franked 1a, 2a6p, violet binocular shaped cachet verso. 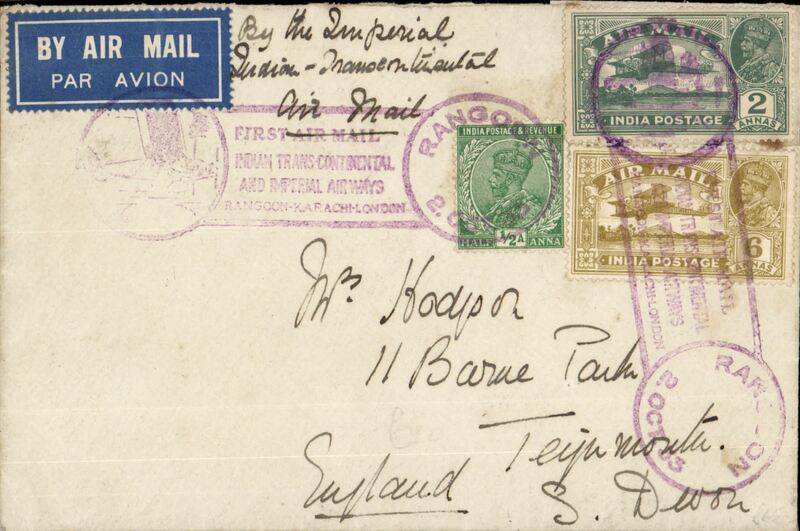 The first mails from England to Burma left Croydon on 23 September 1933. At Cairo they were transferred to an Imperial Airways Hannibal class airliner for the flight to Karachi via the Arabian halts. From there they were carried by Indian Trans-Continental Airways’ Arethusa G-ABPI to Rangoon via Akyab. The flight added 700 miles to the England-Australia chain. The return flight, by the airliner Athena G-ABTK left Rangoon at 7am on 2 October 1933, connecting with Imperial Airways at Karachi on 4 October (ref Brown J, Indian Air Mails, 1995, and Wingent P, 1999). Small mail, Newall 33.18 c1, 60 units. 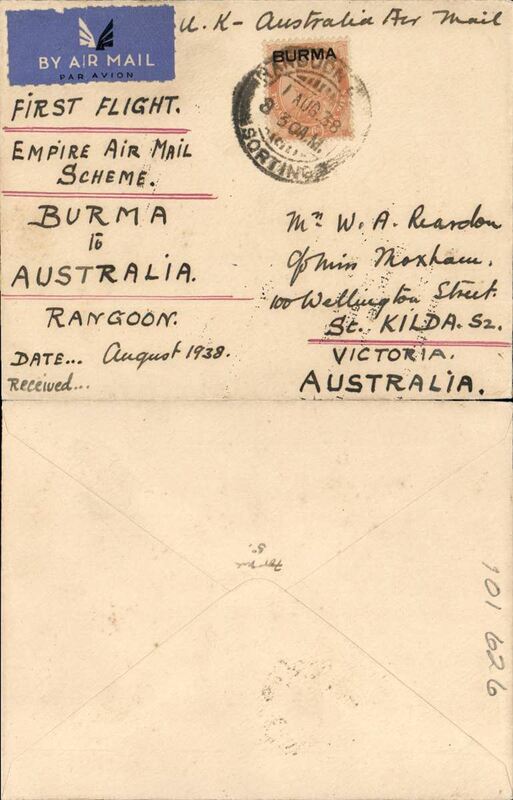 Empire Airmail Scheme: Stage 3, first dispatch at the reduced EAMS unsurcharged rate from Rangoon to Sydney, no arrival ds, plain cover franked 2 annas 6 pies, ms "UK-Australia Air mail/First Flight/Empire Air Mail Scheme/Burma to Australia" flown on service SE 1 by Empire C Class Flying Boat 'Capella' (see Aircraft Movements on Imperial Airways' Eastern Route, Vol 2 Wingent P). Empire C Class Flying Boats were developed specifically for the Empire Air Mail Scheme for service from England to Australia and Africa. 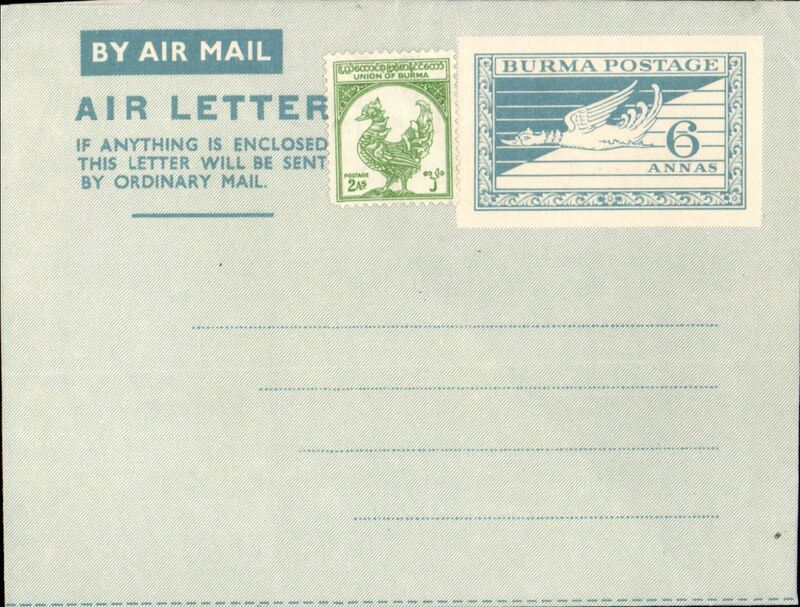 Empire Airmail Scheme: Stage 3, Yamethin to England, no arrival ds, non philatelic cover dispatched at the reduced EAMS rate of 2 anna 6 pies, imprint airmail etiquette cover franked India 2 annas 6 pies opt 'Burma', flown on Imperial Airways flying boat service SW 21 from Sydney to Southampton by 'Cooee' (see Aircraft Movements on Imperial Airways' Eastern Route, Vol 2 Wingent P). Empire C Class Flying Boats were developed specifically for the Empire Airmail Scheme for service from England to Australia and Africa. Uncommon origin. 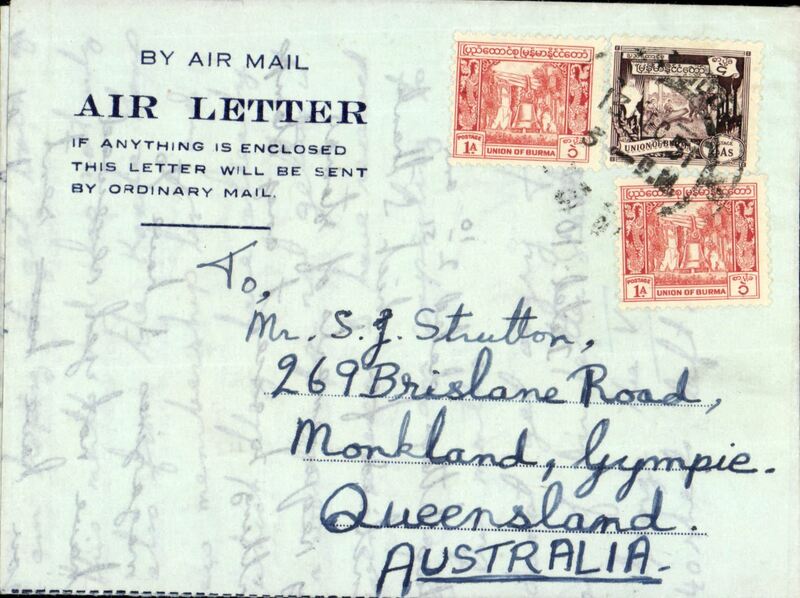 Uncensored WW II airmail, Burma to Tasmania, bs Hobart 6/12, airmail etiquette cover franked 14 annas, canc Mamyo cds. Uncommon origin/destination combination. 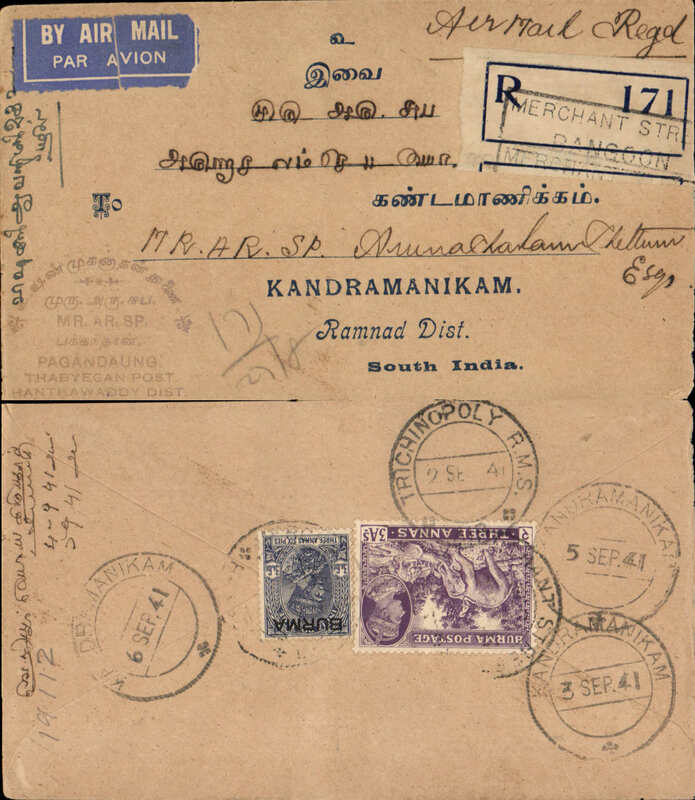 Uncensored WW II airmail, Rangoon to Kandramanikam (South India), bs 3/9, via Trichinopoly 2/9, registered (label) cover franked 6 1/2anna, blue/white airmail etiquette.Uncommon destination. Commercial imprint etiquette underpaid ? 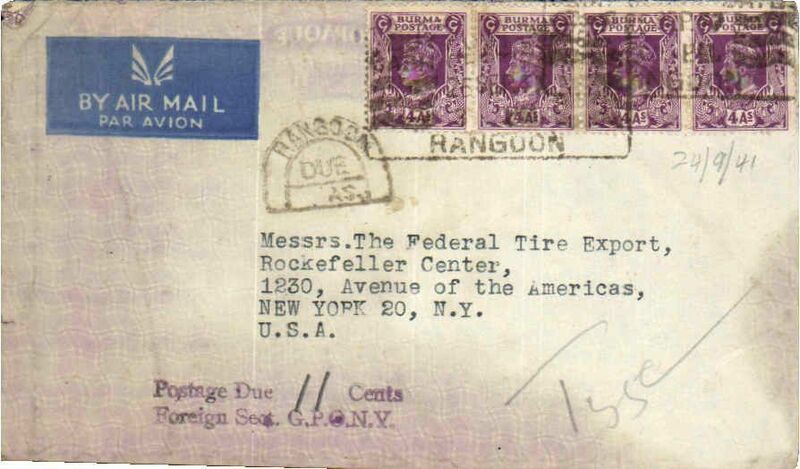 1941 air cover from Rangoon to New York, franked 16a, black semi-circle "Rangoon/Due/…As", and violet "Postage Due (ms) 11 Cents/Foreign Sect. GPONY" hs's, both on front. Blue on Grey blue 6 annas Air Letter sheet, Flying Hintha design, with additional 2 annas adhesive, unused. Blue/dark blue air letter to Australia, franked 6 annas, canc Rangoon cds. Rangoon to England, plain cover franked 5R x24, fine strike violet framed 'By Air Mail' hs. 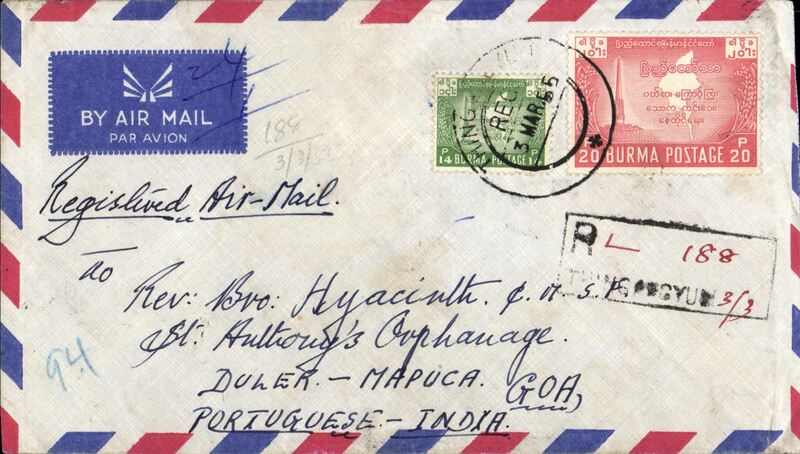 Burma to Goa, Portuguese India, Thingangyon to Mapuca 9/3, via Goa 9/3, registered (hs) airmal cover franked 94p. Unusual origin/destination combination. 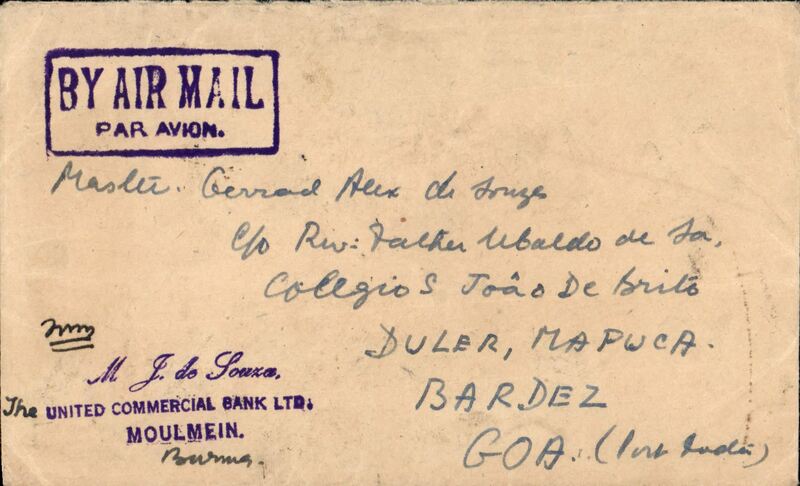 United Commercial Bank, Moulmein, Burma to Goa, bs Mapuca, franked 45P, canc black framed propaganda date stamp "Buy Post Office Cash Certificates/11 Apr 1956/Moulmein", fine strike violet framed "By Air Mail" hs. 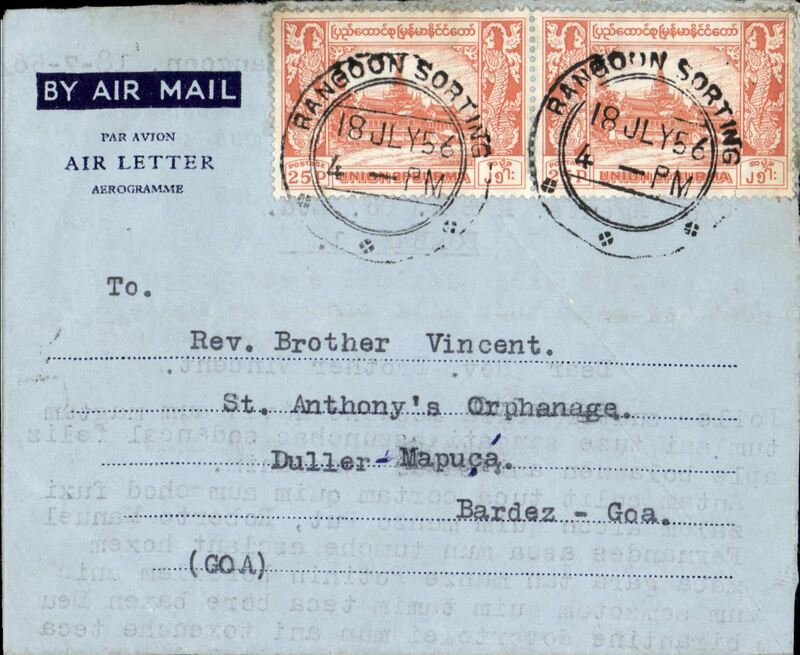 Dark blue/light blue air letter sheet, Rangoon to Goa, bs Duller-Goa. 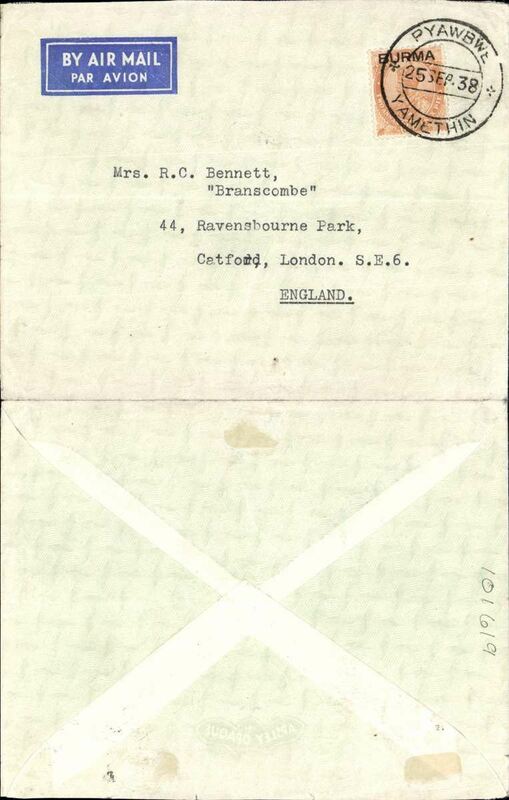 Rangoon to England, private 8/12 receiver, registered airmail cover franked 165P. England,private 8/12/56 receiver, registered airmail cover franked 165P. Green/cream Inland Air Letter sheet #2 , Flying Hintha design, with volet handstamp reading 'Air Letter/Aerogramme', unused.